My husband recently told me to “chill out” about dinner during the dog days of August. Being a child of the 60’s (yeah, way to date myself) I took it to mean that I was obsessing on what to make and asking way to many questions about preferences to a man who just wanted to eat something NOW and that I should relax and make something easy. Cold pasta seemed like a great idea. This time of year, when the temperature and humidity are soaring and dairy or pareve is mandatory, cold pasta seems a whole lot more appealing than hot pasta. Most dishes easy to prepare and, of course, they can be made the night before or in the morning so all you have to do is take them out of the refrigerator and serve. 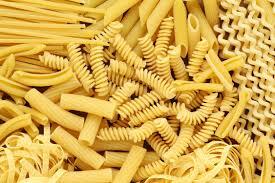 I find that pasta salads require a more robust pasta than angle hair or spaghetti pasta. I often use bow tie, rottini or fusicilli shapes. Once the pasta is cooked, you’ll need to cool it quickly by draining it and then running it under cold water. Then drain it thoroughly. If you make the pasta salad ahead of time, bring it out of the fridge at least 30 minutes before serving. Be a little heavy handed with the herbs and spices and especially the salt (most of the salt you use in the cooking of the pasta gets drained or rinsed off). If your pasta has been refrigerated for several hours before you make your salad you’ll want to taste it before you serve it and adjust the seasoning, if necessary. If you plan on serving it right after you make it, let it sit about 10 minutes before serving as the flavors may need a little time to blend. Pasta salads lend themselves to a variety of different ethnic flavors. You can do a Greek, French with Provencal touches, Asian, Italian or in a moment of wild abandon, you could just add what ever it is you had lying around the pantry that looks tasty. 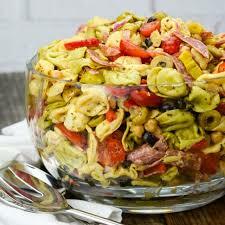 Pasta salads are also a great way to use up those pesky half jars of “stuff” hiding in the refrigerator. You can also raid your staples shelf and toss in olives, black beans and chick peas (great way to add fiber and low-fat protein). I’d be totally remiss if I didn’t end with the fact that tomatoes are just about perfect in any pasta salad. Fill a large sauce pans with 2 quarts hot tap water. Cover and bring the water to a boil. While the water is heating trim the green beans and cut them in half, crosswise. When the water has come to a boil, add 1 tablespoon salt and the pasta. Stir well and cover. When the pasta returns to a boil, stir again. If using thin pasta, add the green beans at this point. If thicker pasta, cook 5 to 7 minutes, depending on the shape, then add the green beans. Stir and cook until the pasta and the green beans are cooked but still firm, about 5 minutes more. While the green beans and pasta cook put the chopped tomatoes and onions into a large serving bowl. Add the basil and roasted red peppers to the tomatoes and onions. Mix to combine. In a small bowl, mix the olive oil, vinegar, salt and pepper. Drain the pasta and green beans in a large colander and rinse under cold water until cooled. Pat dry with paper towel. Add the pasta and green beans to the tomato mixture. Add the dressing and Parmesan cheese (if using) and toss well. Serves 4. This recipe can be doubled or tripled. Bring a large pot of water to a boil. Add the linguine and cook at a rapid simmer until al dente, about 8 minutes. Drain the linguine and rinse under cold water until cool. In the meantime, combine the red peppers and artichokes, their liquids, the sun-dried tomatoes, and parsley in a food processor. Pulse on an off until the mixture is coarsely and evenly chopped. In a serving bowl, combine the red pepper and artichoke mixture with the linguine and toss to combine. Add the carrots, tomatoes, and vinegar. Season to taste with salt and pepper and toss again. Decorate the top with pine nuts and serve. Serves 6 to 8. Begin cooking the tortellini according to package directions. Layer the frozen peas and the broccoli florets in a large saucepan with l/2 inch of water. Bring them to a simmer and steam over moderate heat, covered, until the peas are thawed and the broccoli is bright green, about 3 to 4 minutes. Drain the peas and broccoli and rinse them under cool water until they are at room temperature. In the meantime, drain the roasted peppers, reserving the juices in a small mixing bowl. Cut the peppers into strips. Combine the liquid from the red peppers with the olive oil, vinegar, mustard and Parmesan cheese. Whisk to combine. In a bowl of a food processor combine the oil, vinegar, garlic, cumin, one half of the tomatoes and cucumbers, salt, pepper and hot sauce. Blend and then set aside.Cook pasta according to package directions. Drain and rinse with cool water in colander, place the cooked pasta in large bowl. Add the dressing and toss to combine. Add remaining tomatoes, cucumbers, peppers onions, olives and parsley. Toss to combine. Cover and place in refrigerator for 4 hours. Serves 8.